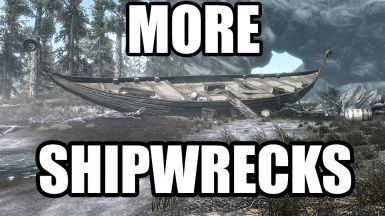 More Shipwrecks adds three brand new shipwrecks into the world of Skyrim, with plans to continue expanding in the coming months. The Bent Nail: The Bent Nail ran aground after the waves of a large storm pushed her onto a small island in 4E 172. One of the two crew members, Vigulf, was severely injured, so the other, Arngeir, went to find help. Arngeir was never seen again. One crewmember lost, other missing and presumed dead. 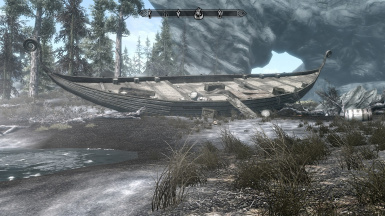 The Bearded Skeever: Suffering a similar fate as The Bent Nail, the Bearded Skeever was thrown against a small island near Winterhold during a storm in 4E 178. The captain and only man aboard was killed. The Lady Dawn: Set sail from Solitude in 4E 196 to make the long journey to the Imperial City in Cyrodiil. Loaded with some various goods, it’s main cargo was the bodies of seven Imperial soldiers who were felled in battle during a skirmish with Forsworn. Despite high winds, the captain ordered the ship to cast off on their journey. Barely out of port, the ship was pushed ashore by the wind and waves to where she rests today. The Chenaga: A fishing vessel in its time, the Chenaga was caught in a vicious storm in 4E 194. Seeking shelter, the crew attempted to steer it into a small cove. Unfortunately in their haste they hadn’t read the map very carefully and found themselves being battered against the shallow bottom of the tiny cove. 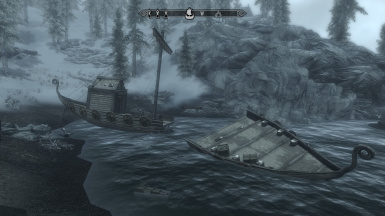 Unable to get their ship out of the cove, it was destroyed by the tremendous waves. The pieces continue to lay where they came to rest after the storm subsided. One of the four crew members, Ulfred, was swept out to sea when the ship broke apart and was never seen again. Three crew members saved, one lost. The Papa's Dream: A fairly small boat, the Papa's Dream was used as a small transport mainly operating between Solitude and Morrowind. Off the clock it was used by its owner as a skooma smuggling vessel. One night when the river ran high the owner attempted to make a run under the cover of darkness to Dragons Bridge. Unfortunately for him he misjudged the depth of the river and his vessel became caught on some rocks. He and his one crew member spent the entire night trying desperately to free the trapped ship. Their work was all for not, as the river slowly shrank to its original size making it even more futile for the two man team to free her. At daybreak they were spotted by a man on a morning walk who went back to Solitude to recruit the help of the cities guard to help free the ship. Once the guards found what the mans cargo was, he and his crewman were immediately arrested and taken to prison. The ship, which by that time had developed a large hole in her bow from the rocks, was deemed too much of a hassle to free and was left to be forgotten.